In this video tutorial, Alan Lamont, Vice President, Digital Advancement Academies, Bentley Systems, provides good information on implementation of BIM in construction industry. 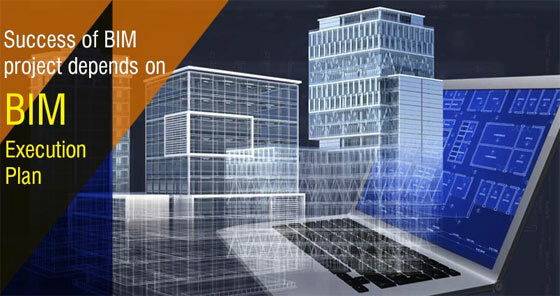 BIM implementation is gaining popularity among construction sectors since more and more decision-makers get the ability to recognize how by virtually prototyping the building under construction, they can evaluate the design more efficiently, attain more precision in construction as well as evaluate alternatives in respect of cost and other parameters. With BIM, it is possible to utilize the resources and optimize the workflows and as a result the productivity and profitability are increased. But there are some barriers for which BIM is not adopted full fledgedly in all construction projects. The barriers comprise of five major factors ranging from intricacy in changing people’s habits, restricted applicability, interoperability issues, restricted budgets and slack in various operating standards. To get more detail information, go through the following video tutorial. 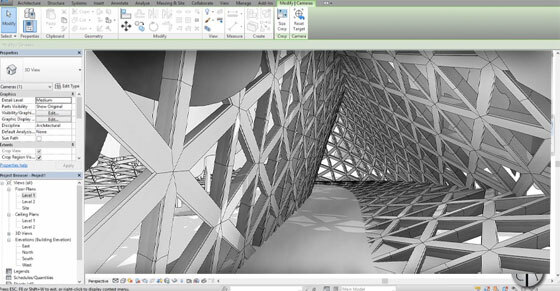 In this revit video tutorial, you will be familiar with the necessary steps to model a parametric walkway (twisted looking structure with triangular grid) in Revit. It begins like a conceptual mass family. You will learn the methods essential for creating model of a spline with triangular profiles at various angles as well as transform it into a form. Then you will gather knowledge on how to create the model of a curtain panel based family and load it into the mass. Finally, you will learn how the mass is loaded into the project with the addition of a concrete strip at the floor level. While generating a mass family in the Family Editor, it is possible to load the family into a project, and set instances of the mass family in the project. Click NewConceptual Mass. In the New Conceptual Mass dialog, opt ofr Mass.rft, and click Open. The conceptual design environment opens. The Forms tool and other tools are applied to generate the mass. In the tutorial, the following shortcuts are used to accelerate the speed of the work. To view the complete processes, go through the following revit tutorial. 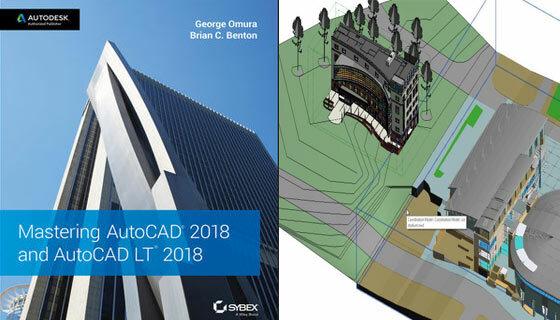 George Omura, a licensed architect and Autodesk Authorized Author and Brian C. Benton, senior engineering design technician have written an exclusive ebook titled as “Mastering AutoCAD 2018 and AutoCAD LT 2018 for CAD professionals. If you’re new to AutoCAD, this book will be your “bible;” if you’re an experienced user, this book will introduce you to unfamiliar tools and techniques, and show you tips and tricks that streamline your workflow. Mastering AutoCAD 2018 and AutoCAD LT 2018 is specifically designed for the design and drafting professional to fulfill their requirements. With Step-by-step guidelines, the book sheds light on the latest AutoCAD tools and techniques. The book contains hands-on projects to improve your practical skills which can be employed directly to real-world projects. The companion website highlights the related project files and other bonus content to facilitate the users to deal with each important technique. This new edition is updated to contain the latest AutoCAD and AutoCAD LT features so that the users can deal with real-world projects efficiently. • Customize AutoCAD to adapt the way you work, combine outside data, and much more. 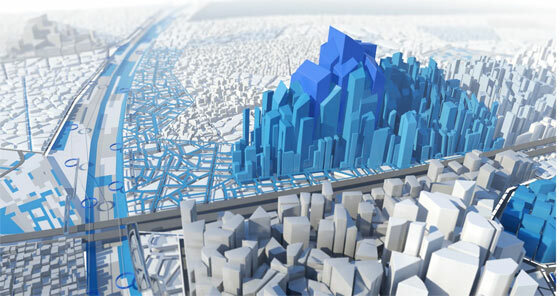 Autodesk Connector for ArcGIS is first in-product competence from joint venture among Esri and Autodesk. More advance features are included in InfraWorks update. Autodesk’s alliance with Esri adds new wings in the latest Autodesk InfraWorks software update. The most exciting feature is that there exists a new Autodesk Connector for ArcGIS. The objective of Autodesk is to make BIM + GIS workflows superior across the software pipelines of different infrastructure design and engineering professionals. The connector is utilized to develop an InfraWorks model directly from GIS data to be published to Esri’s ArcGIS Online. All the data in GIS from Esri’s ArcGIS comes into InfraWorks. This information flow among these two most recognized apps signify that when the Esri-based GIS data is updated the InfraWorks is also updated and restored. The latest update to InfraWorks comprises of other new features and enhancements. It becomes easier to edit vertical curve values directly in the Curves Properties panel. There exists Delayed Model Regeneration to facilitate the designers to proceed on and not waiting for entire model to be refreshed each time while creating small modifications to the model, similar to moving a curb. InfraWorks views can be easily availed through web and mobile devices but the feature now comprises of a bookmarks and detailed model data view. Finally, BIM 360 users will be able to view account and project name data evidently while receiving projects in several and different BIM 360 accounts. It is a BIM 360 upgrading that carries over to superior workflows for InfraWorks. The prime responsibility of a surveyor is to deal with several measurements, values, costs, schedules dimensions and demarcations which are gathered from trustworthy and precise sources of data. 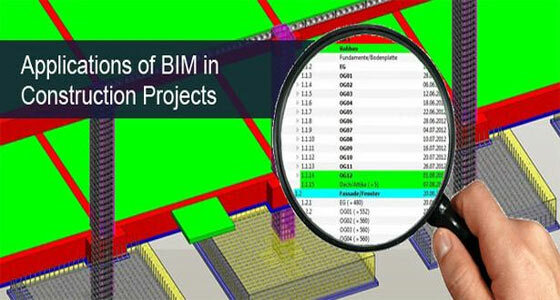 BIM facilitates the surveyors to avail and evaluate all this data in form of geometries, numerals, and essential foot notes [with annotations to building object and modeled elements] for clear-cut information. As-built BIM models allow in visualizing the data, finally authorizing surveyors to obtain detail information as well as insights. This insight allows survey professionals to perform proper analysis with the purpose of giving suggestions to architects and contractors for the sake of occupants and all the stakeholders who are associated with the building design and development projects. When it is required to arrange the BIM models in as-built conditions of the building, the construction works or the infrastructure are analyzed prior to scanning and redesigning the project. By maintaining exact level of detailing of designs in BIM, the project is expanded and a development stage is reflected for construction management related decisions. Issues associated with constructability, probable clashes, challenges in building up a wall or taking off one, time and cost, etc. are examined, risks are computed and mistakes are amended in the initial phase by a team collaboration among the engineers and the surveyors. • BIM allows the surveyor to quickly finish the work cost-effectively. With BIM, the surveyors get the ability to accomplish their jobs efficiently & with superior collaborative input. BIM for surveyors is rightly crucial whether it is a project of new construction works or retrofitting a really elderly one. With advancement of BIM, the demand for BIM Execution or Implementation Plan is also increased. BEP facilitates every project stakeholder to get updated with the project. Now MEP firms extensively implement BEP for improved BIM Level 2 execution. BEP becomes part and parcel for construction projects specifically large and complicated projects like BIM. The basic BEP plan is utilized to make sure that all the stakeholders, architectural, structural and MEP professionals remain on the equivalent page and proceed at the same predefined pace retaining the clear view in focus. So, BEP in its nature signifies consulting insights on how BIM will be enforced across the project for each professional ranging from designer, MEP engineer, MEP consultant, or a MEP contractor as well as inter-disciplinary design teams and engineers. How does BEP impact MEP firms? 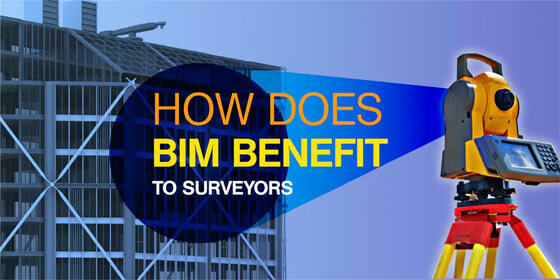 Specifically MEP firms reap the most benefits from BEP on BIM coordination. Any MEP firm that deals with a complicated construction project plays a significant role across phases to remain organized. With a BIM implementation plan or a BIM consulting partner BEP is formulated easily to make sure that each stakeholder recognizes their part and can adopt the activities consequently and make out what should be anticipated from other disciplines. 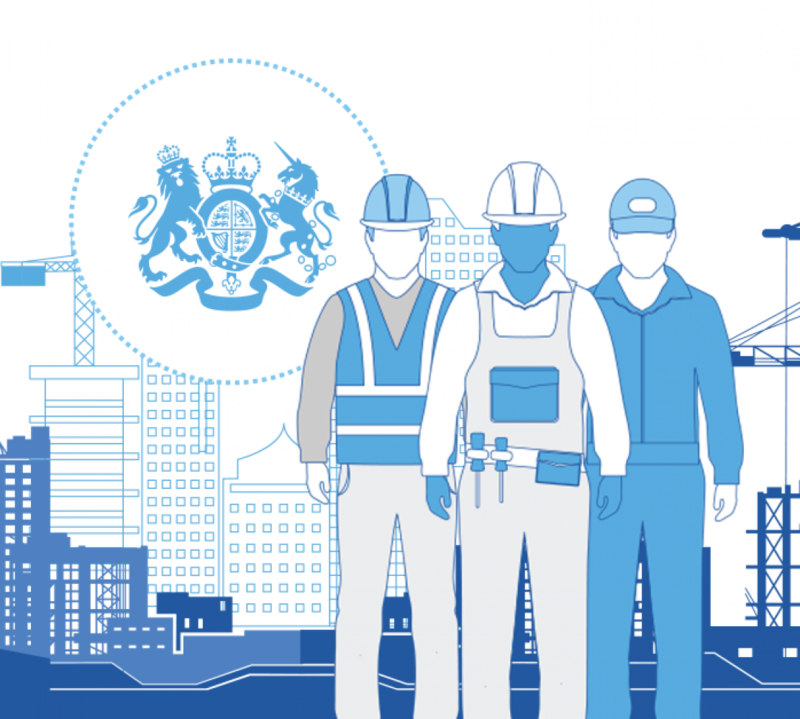 • BEP Documents: The information provided in BEP documents comprise of a plan for BIM adoption, how the data in BIM files are generated, controlled, documented and distributed across the disciplines. When Mep Firms can access such information sets, their teams will to able to undertake decisions for fabrication, delivery at site and installation. • Project Guide: Aside, when major deliverables and a guide to project milestones are evidently defined, MEP engineers and teams who participate in the project at later stages with regards to other design engineers, BEP plays a very important role in adopting up to date decisions. • BEP for construction projects: BEP for the construction projects also comprise of practical working method with the details of filenames, abbreviations and acronyms, annotations, symbols in mark-up drawings (if any) and lots other used in the BIM model. The detailed plans in BEP with a guide simplify the task of MEP teams; particularly in formulating MEP coordination drawings and finalizing MEP layout. Advantages of BEP to MEP firms: When BEP are designed with complete documents to integrate various teams and collaborate to accomplish the project in a systematic and phased manner. BEP provides benefits to MEP teams in the following ways. 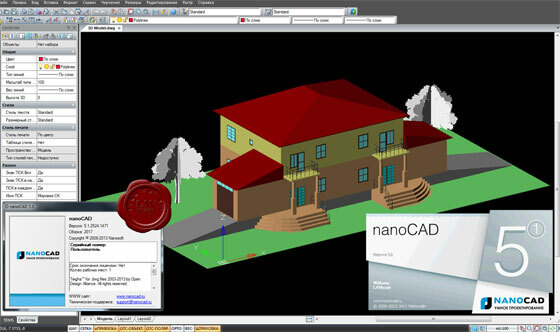 Nanosoft launched nanoCAD 5.0. It is a free, fully operative CAD software. After making registration and activating the software, the users can obtain a one-year renewable license and utilize the software for any purpose. Once the software is installed, the users will be able to import drawing (DWG) files or develop new projects as well as export and share with others, devoid of any watermarks. It is compatible with AutoCAD 2013/2014 version DWG files. nanoCAD can now read and write AutoCAD-supported DWG files which are well-suited with DWG files compatible with AutoCAD 2013. Better object selection – The Quick Selection (QS) command is upgraded significantly and extended with a few vital capabilities. Now the users will be able to produce selection conditions for graphic primitives like arcs, polylines, splines and lines. The QS command in nanoCAD 5.0 also facilitates the users to produce selection conditions for complicated objects like tables, notes, dimensions and blocks. The users can now add a block with .dxf file extension for greater adaptability. nanoCAD products comprise of nanoCAD Plus, nanoCAD Pro, nanoCAD Mechanica, nanoCAD Construction, nanoCAD Construction Site.